Using JTA, your application controls all transactions in the same standard way, whether the transactions act on the GemFire cache, a JDBC resource, or both together. When a JTA global transaction is done, the GemFire transaction and the database transaction are both complete. An application creates a global transaction by using javax.transaction.UserTransaction bound to the JNDI context java:/UserTransaction to start and terminate transactions. During the transaction, cache operations are done through GemFire as usual as described in GemFire Cache Transactions. Note: See the Sun documentation for more information on topics such as JTA, javax.transaction, committing and rolling back global transactions, and the related exceptions. GemFire can work with the JTA transaction managers of several containers like JBoss, WebLogic, GlassFish, and so on. The “last resource” feature in certain 3rd party containers such as WebLogic allow the use one non-XAResource (such as GemFire) in a transaction with multiple XAResources while ensuring consistency. You can also use GemFire as the JTA transaction manager. When GemFire participates in a global transactions, you can still have GemFire cache writers and cache loaders operating in the usual way. At startup GemFire looks for a TransactionManager (javax.transaction.TransactionManager) that has been bound to its JNDI context. When GemFire finds such an external transaction manager, all GemFire region operations (such as get and put) will participate in global transactions hosted by this external JTA transaction manager. This figure shows the high-level operation of a JTA global transaction whose resources include a GemFire cache and a database. Each region operation looks up for presence of a global transaction. If one is detected, then a GemFire transaction is started automatically, and we register a javax.transaction.Synchronization callback with the external JTA transaction manager. At transaction commit, GemFire gets a beforeCommit() callback from the external JTA transaction manager. GemFire does all locking and conflict detection at this time. If this fails, an exception is thrown back to JTA transaction manager, which then aborts the transaction. After a successful beforeCommit()callback, JTA transaction manager asks other data sources to commit their transaction. GemFire then gets a afterCommit() callback in which changes are applied to the cache and distributed to other members. You can disable JTA in any region that should not participate in JTA transactions. See Turning Off JTA Transactions. Use the following procedure to run a GemFire global JTA transaction coordinated by an external JTA transaction manager. Configure the external data sources in the external container. Do not configure the data sources in cache.xml . They are not guaranteed to get bound to the JNDI tree. Configure GemFire for any necessary transactional behavior in the cache.xml file. For example, enable copy-on-read and specify a transaction listener, as needed. See Setting Global Copy on Read and Configuring Transaction Plug-In Event Handlers for details. Make sure that JTA transactions are enabled for the regions that will participate in the transaction. See Turning Off JTA Transactions for details. Start the transaction through the external container. Initialize the GemFire cache. GemFire will automatically join the transaction. Execute operations in the cache and the database as usual. Commit the transaction through the external container. In the previous two JTA transaction use cases, if the GemFire member fails after the other data sources commit but before GemFire receives the afterCommit callback, GemFire and the other data sources may become inconsistent. To prevent this from occurring, you can use the container’s “last resource optimization” feature, with GemFire set as the “last resource”. Using GemFire as the last resource ensures that in the event of failure, GemFire remains consistent with the other XAResources involved in the transaction. To accomplish this, the application server container must use a JCA Resource Adapter to accomodate GemFire as the transaction’s last resource. The transaction manager of the container first issues a “prepare” message to the participating XAResources. If the XAResources all accept the transaction, then the manager issues a “commit” instruction to the non-XAResource (in this case, GemFire). The non-XAResource (in this case, GemFire) participates as a local transaction resource. If the non-XAResource fails, then the transaction manager can rollback the XAResources. Locate the version-specific geode-jca RAR file within the lib directory of your GemFire installation. Add your container-specific XML file to the geode-jca RAR file. Make sure that the geode-dependencies.jar is accessible in the CLASSPATH of the JTA transaction coordinator container. Deploy the version-specific geode-jca RAR file on the JTA transaction coordinator container. When deploying the file, you specify the JNDI name and so on. Configure GemFire for any necessary transactional behavior. Enable copy-on-read and specify a transaction listener, if you need one. See Setting Global Copy on Read and Configuring Transaction Plug-In Event Handlers for details. This returns javax.naming.Context and gives you the JNDI associated with the cache. The context contains the TransactionManager, UserTransaction, and any configured JDBC resource manager. Start and commit the global transaction using the UserTransaction object rather than with GemFire’s CacheTransactionManager. 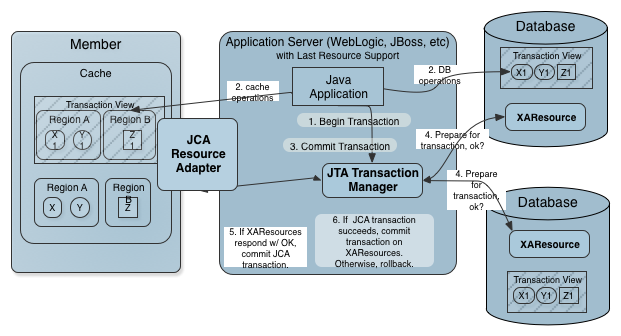 See JCA Resource Adapter Example for an example of how to set up a transaction using the JCA Resource Adapter. You can also use GemFire as the JTA transaction manager. As of GemFire 1.2, GemFire’s JTA transaction manager is deprecated. GemFire ships with its own implementation of a JTA transaction manager. However, note that this implementation is not XA-compliant; therefore, it does not persist any state, which could lead to an inconsistent state after recovering a crashed member. The GemFire JTA transaction manager is initialized when the GemFire cache is initialized. Until then, JTA is not available for use. The application starts a JTA transaction by using the UserTransaction.begin method. The UserTransaction object is the application’s handle to instruct the JTA transaction manager on what to do. The GemFire JTA implementation also supports the J2EE Connector Architecture (JCA) ManagedConnectionFactory. Only one JDBC database instance per transaction is allowed, although you can have multiple connections to that database. Multiple threads cannot participate in a transaction. Transaction recovery after a crash is not supported. In addition, JTA transactions are subject to the limitations of GemFire cache transactions such as not being supported on regions with global scope. When a global transaction needs to access the GemFire cache, JTA silently starts a GemFire cache transaction. This topic describes how to run a JTA global transaction in GemFire . Configure the external data sources in the cache.xml file. See Configuring Database Connections Using JNDI for examples. Include the JAR file for any data sources in your CLASSPATH. Configure GemFire for any necessary transactional behavior. Enable copy-on-read for your cache and specify a transaction listener, if you need one. See Setting Global Copy on Read and Configuring Transaction Plug-In Event Handlers for details. Make sure that JTA transactions are not disabled in the cache.xml file or the application code. With UserTransaction, you can begin, commit, and rollback transactions. If a global transaction exists when you use the cache, it automatically joins the transaction. Operations on a region automatically detect and become associated with the existing global transaction through JTA synchronization. If the global transaction has been marked for rollback, however, the GemFire cache is not allowed to enlist with that transaction. Any cache operation that causes an attempt to enlist throws a FailedSynchronizationException. The GemFire cache transaction’s commit or rollback is triggered when the global transaction commits or rolls back. When the global transaction is committed using the UserTransaction interface, the transactions of any registered JTA resources are committed, including the GemFire cache transaction. If the cache or database transaction fails to commit, the UserTransaction call throws a TransactionRolledBackException. If a commit or rollback is attempted directly on a GemFire transaction that is registered with JTA, that action throws an IllegalStateException. See GemFire JTA Transaction Example.